An extremely rare and beautiful French pictorial broadside game board of a trip around the world. 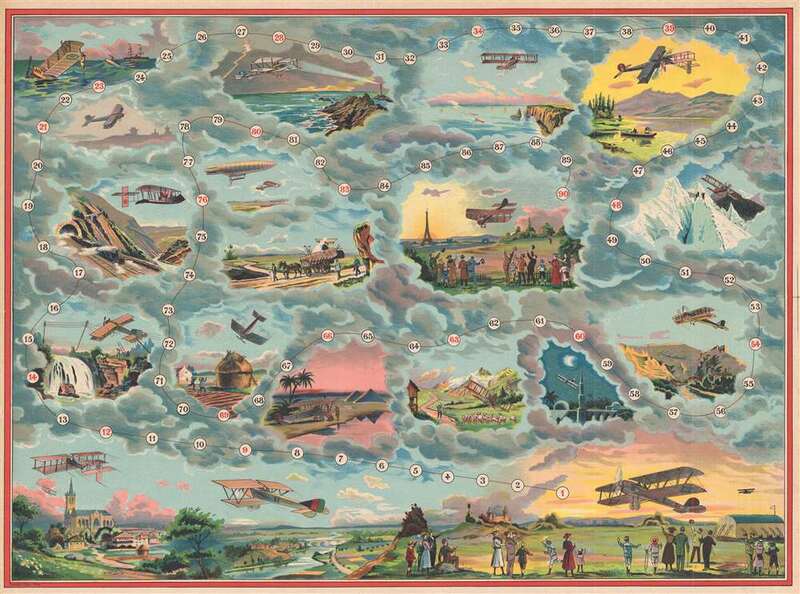 This is an extremely rare and beautifully colored c. 1912 Léon Saussine pictorial map or game board of a trip around the world by plane. The map serves as the board for a jeu de parcours (journey game), which snakes around the world, beginning and ending in France. Along the route, vignettes of the adventures (and misadventures) decorate the board. Several of these vignettes present problems that the adventurers encountered, including getting tangled in telegraph lines, crashing in the sea, and suffering a mid-air collision. Others depict the highlights of the trip, including seeing the pyramids at Giza, flying over exotic landscapes, and harassing a farmer and his flock of sheep. A steam locomotive appears in one of the vignettes as well. The adventure (and the game) ends back in France, with a view of the Eiffel Tower. The map/game was published by Léon Saussine, founder of Jeux Saussine (Saussine Games) in Paris around 1900. We have been unable to locate any examples in institutional collections. A rare opportunity. Léon Saussine (unknown-1896) founded Saussine editions in 1860 and directed the company until his death in 1896, when he was succeeded by his widow and his sons. Saussine games published several types of games, including magnetic games. In 1878 Léon Saussine exhibited at the Exposition Universelle (World's Fair) in Paris. Very good. Repaired tears on verso. Blank on verso.